The Cote Brasserie in Bury St Edmunds. Authentic French classics could soon be on the menu for diners who flock to Peterborough’s Cathedral Square orientated eating out quarter. Cote Restaurants, which has a dozen central London outlets, plus dozens more around the country including Cambridge, Nottingham, and Birmingham, is sounding out the former Santander bank premises on Church Street - directly opposite the entrance to St John’s Church. It has lodged a lincensing application with the city council to open from 8am to 12.30am. Côte’s promises “authentic French classics, freshly cooked to order”, sourcing ingredients of the highest quality as well as an extensive wine list . The inspiration for the food and design of Côte is a modern interpretation of the many famous bistros of Paris. Inspired by new trends, it is dedicated to serving authentic classic brasserie dishes with a modern twist. On the menu, you will find brasserie favourites such as steak frites, moules marinières, corn-fed chicken from rural Brittany and tuna Niçoise, with desserts including Côte’s crème caramel and crème brûlee. The restaurants open early every day for breakfast, through to lunch and dinner with an informal and friendly atmosphere. 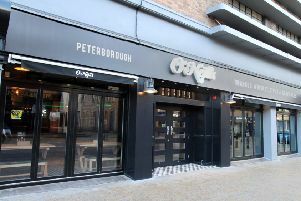 The Cathedral Square area already boasts the likes of Wildwood, Nando’s, Prezzo, Clarkes, Chimchanga and Pizza Express and in the last 12 months they have been joined by Argo Lounge and Bill’s.